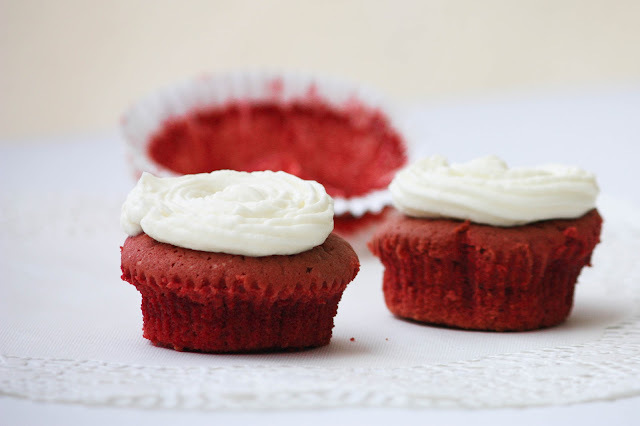 I have the feeling that at the moment everyone is talking about red velvet cupcakes. And especially for Valentine's Day all the food blogs were full of red velvet cupcakes, brownies, cake pops and so on. So I got curious, and wondered what is so special about that red sweet dessert. 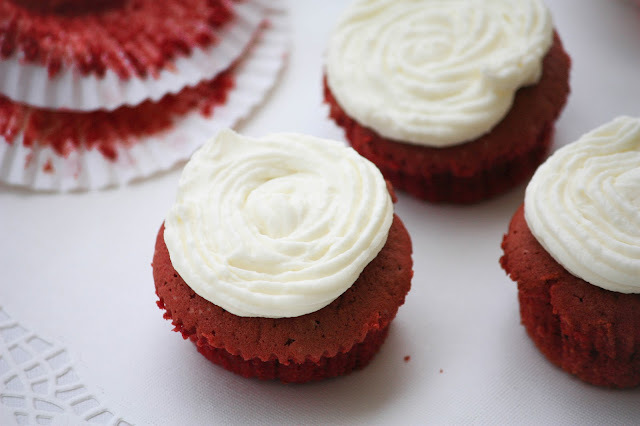 I started checking out recipes, and in the first place I thought, well except from the food coloring there is nothing special about these cupcakes. 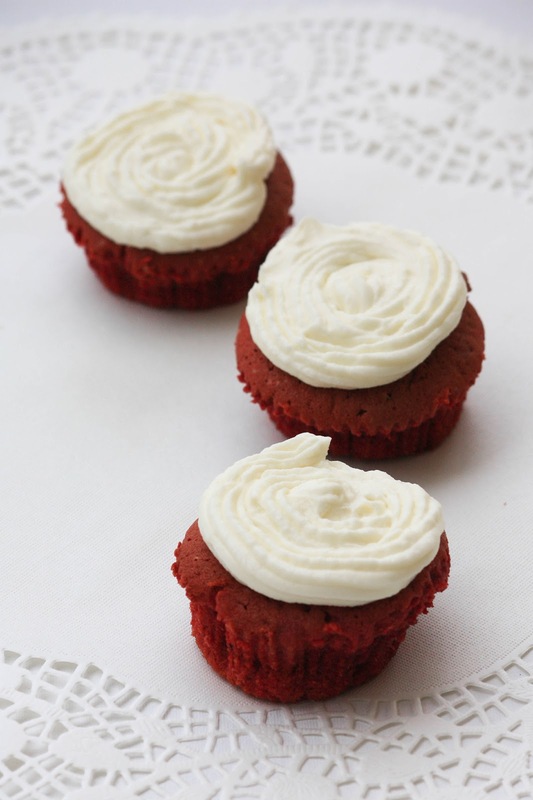 And then two weeks ago, again, a friend was talking about red velvet cupcakes. This is when I thought: OK you have to try them. But which recipe would now be the perfect recipe? 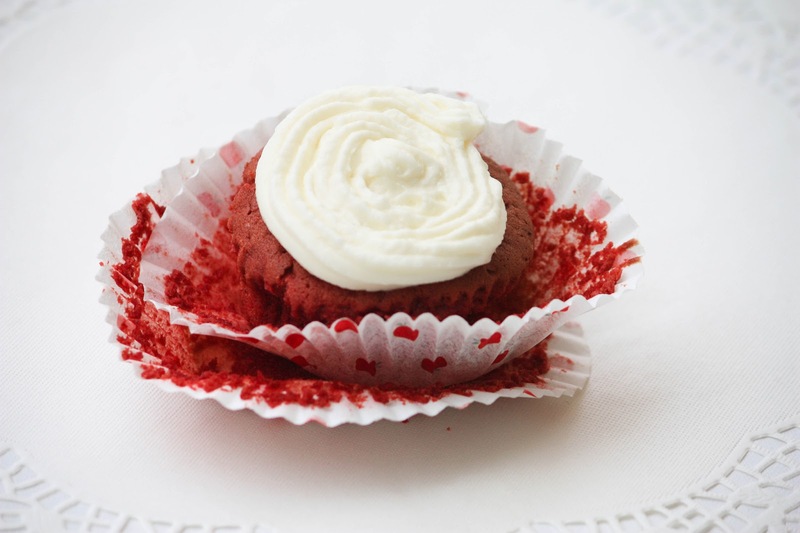 Most of the recipes I found were quite similar, except for the frosting. Either there was too much sugar, or too much butter, or too much food coloring. I have to say, usually I don't like artificial colors when it comes to food. Especially these flashy blue or green ones. But I decided to give it a try. I just purchased a book called "Cantine California" which has a lot of American recipes in it. I don't know if you already know the concept. It's a truck in Paris, moving from one square to another, selling American tradition with French quality of food. As far as I understood is the Author and Manager of the concept an American who grew up in France and tried to combine French quality with American tradition. So far I can say I am convinced of the recipe, and I will try a lot more from that book. In a large bowl soften the butter with a hand mixer. Then add the sugar and mix again until you get a light mixture. Now you can add the egg and the vanilla extract and mix again. In another bowl whisk together the flour, the salt, the baking powder and the cocoa powder. Add to the butter mixture. In a small bowl mix the buttermilk and the food coloring and pour onto the dough. Aside, you should now mix the baking soda and the vinegar and then add them to the dough. Take the hand mixer again and mix until you get an even dough. 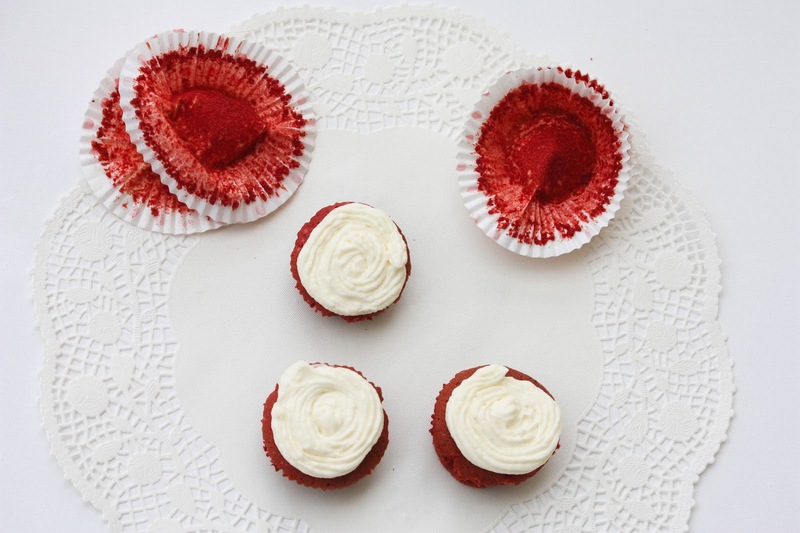 Put cupcake cases into your cupcake mold and pour the dough up to 2/3 into the cupcake forms and bake for 25 minutes. 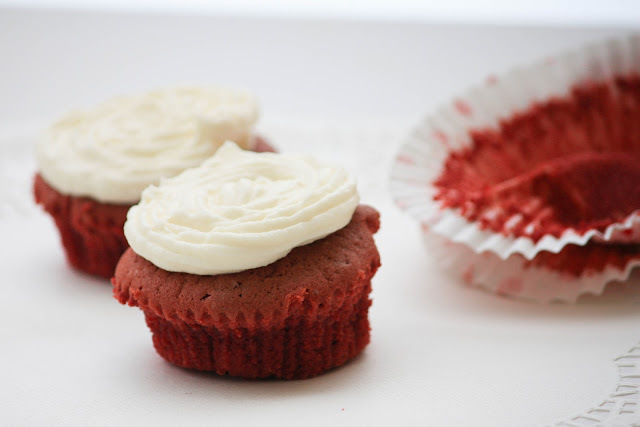 Let them cool down 10 minutes in the mold before putting them on a baking rack.